A Christmas Puppy? Maybe Not. Events of this Christmas will have a profound impact on the dog training industry in April. All those cute puppy-in-a-stocking photos prompt unsuspecting people to give dogs as gifts, inevitably resulting in a high rate of premium business for me and my colleagues. “Christmas puppies” often are impulse purchases, in a spirit of love and giving and generosity that goes with the season, but without the hard self-assessment that goes into asking oneself if one has the time and the energy and the inclination to give the necessary commitment to raising and socializing and educating that puppy. Better to get that new puppy at a less emotionally charged time of the year, when the decision to add a dog to the family is a less impulsive and more carefully considered one, uninfluenced by seasonal generosity of spirit, which might just fade a bit after the tree comes down and the lights are put away. Every April I see frenzied clients at my training center at wits end with their now-adult sized dogs that are totally out of control. They have no leash manners, refuse to come when called, hyperactive from a lack of exercise, obese from too many treats, and unwilling to even acknowledge their name. Most people think that cute little puppy that was under the tree on Christmas morning will stay that way. On the contrary, they grow up and they grow up quick. Think of it this way. Could you go from the crib to high-school? No way! Puppies need exercise, discipline and affection—in that order. 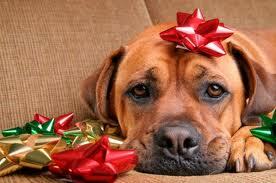 The best gift you can ever give that Christmas puppy is obedience training. This will not only build a lifelong bond but give you the control, leadership and routine that your dog so much desires. If you are absolutely set upon getting your family a puppy for Christmas, consider this alternative instead: Purchase a leash, a collar, a good book on raising a puppy, a gift certificate for a veterinary checkup, a gift certificate for puppy socialization classes from one of the local obedience instructors, a book or video tape on the topic of how to select the right dog for your family (there are several, including even a computer program that purports to help you do this), or a gift subscription to one of the dog-oriented magazines. Wrap these up and put them under the tree. As family members unwrap the various pieces of the “puzzle”, their delight and anticipation will grow. They will gradually understand what this present is! Then, after the Christmas tree is taken down and the frenzy of the holiday season is behind, the family can once again enjoy together the anticipation and excitement of discussing and selecting a breed, selecting a breeder, selecting an individual pup, and so on. This will increase the family’s mutual commitment to, and investment in, the well-being of the newest family member. It will be a project the family has done together, which is a wonderful way for any adoption to commence. This will not decrease the enjoyment of your new puppy; I guarantee it. It will increase it by many fold. And it will be a better start both for the puppy, and for the long-term relationship between dog and owner(s). A dog with a good introduction to its adoptive family is much more likely to become a long term companion rather than just another tragic statistic.